Cruising the beautiful West Coast in 2019! Launched in 2017 in China, the Norwegian Joy will begin her inaugural season on the U.S. West Coast in spring 2019. 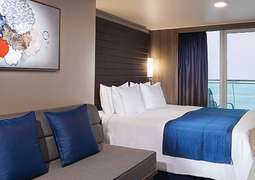 A planned $50 million refurbishment will bring her up to par with her sister ship, the Norwegian Bliss, before she begins her new routes to Alaska, the Mexican Riviera, and the Panama Canal. The Norwegian Joy is a family-friendly, thrills-and-frills ship with innovative new amenities to keep passengers entertained. Step into another world at the Galaxy Pavilion, a high-tech space which offers laser tag, an interactive video wall, and “7-D” immersive virtual experiences. Or have a spin on a two-level go-kart track, the first of its kind at sea. All that adrenaline got your worn out? Lean back and relax in your private accommodations, where virtual balconies will guarantee that you never miss a thing. The elegantly-appointed, one-of-a-kind ship is your key to an unforgettable cruise vacation. 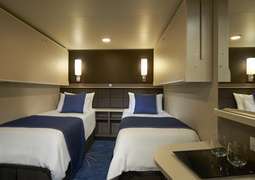 With innovative apartment-style group staterooms and accommodation categories to suit every budget, the Norwegian Joy is a great ship for families. 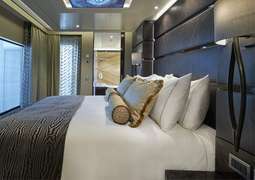 Interior staterooms are extra-spacious, with some spaces sleeping up to six guests, and large TV screens that can be set to either entertainment channels or virtual balconies provide ocean views and natural light. 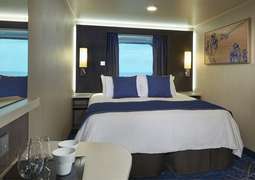 There are more categories of premium accommodations than ever before, and the exclusive, ship-within-a-ship Haven area is more expansive than ever before. Originally designed for Chinese cruise passengers, the Norwegian Joy currently features a mixture of Western and Eastern cuisine. In addition to signature Norwegian restaurants such as a steakhouse, an Italian restaurant, and a French bistro, there’s also a noodle bar and a Korean barbecue place. The Norwegian Joy features two separate tea rooms onboard: the Joy Tea Room, offering a traditional Asian style of tea, and the Grand Tea Room, which features English-style tea service complete with pastries and sandwiches. Stay tuned for updates about new dining venues following the ship’s 2019 renovation! The Norwegian Joy is jam-packed with fun activities to keep cruisers of all ages and interests occupied. In addition to the Galaxy Pavilion virtual reality center and the first racetrack at sea, she also features an extra-large Splash Academy play center for families and kids. For adults, the Norwegian Joy caters to a more affluent clientele. The shopping area has been expanded, and features products from high-end brands such as Bvlgari, Rolex, and Versace. An expansive casino takes up a prominent place in the ship, and a second, exclusive casino is also tucked away at The Haven. The Mandara Spa, which guests may recognize from other Norwegian ships, offers beauty treatments, saunas, steam rooms, and a thalassotherapy pool. Unique to the Norwegian Joy is a spacious green area called Serenity Park, where guests can practice tai chi and yoga or lounge on the artificial grass. Unfortunately, this feature comes at the expensive of deck space for sunbathing and lounging, and the pool has been pushed to one side. It remains to be seen whether this feature will survive the ship’s upcoming renovation. A resort-casual dress code reigns supreme on the Norwegian Joy, though some guests choose to dress up for dinner.